Reference number for this case: 17-Aug-54-Montluçon. Thank you for including this reference number in any correspondence with me regarding this case. Claude Coche, an industrial designer residing in the town of Vincennes, declared that in the afternoon of 17 August 1954, he had seen a "flying saucer" in the sky over Montluçon, Allier Department. He described what he saw as a luminous, brilliant white, disk-like object. The phenomenon was visible for several seconds before it was hidden by a cloud. On the 18th [of August 1954], a report from Montlucon. The website indicates that on 17 August 1954 in Vincennes, France, "An unidentified object was sighted, but with appearance and behavior that most likely would have a conventional explanation. One white disc was observed." The source is indicated as Hall, Richard H., UFO Reports from the Files of the CIA, Fund for UFO Research, Washington". The website indicates that on 17 August 1954 at 15:00 in "Montlucon", France, "An unidentified object was sighted, but with appearance and behavior that most likely would have a conventional explanation. One object was observed." Not looked for yet. Possible meteor, or possible plane. [---] Article in the national newspaper L'Aurore, Paris, France, August 19, 1954. 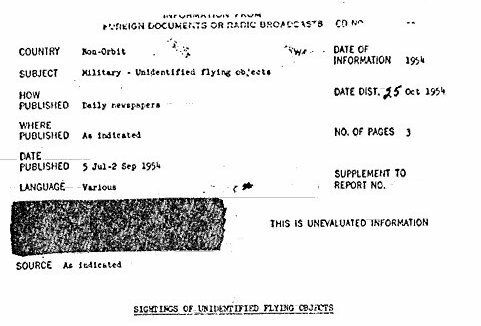 [ci1] "Information from foreign documents or Radio Broadcast - Sightings of Unidentified Flying Objects, 31 July - 20 September 1954", rapport par la CIA (Central Intelligence Agency, USA), pages 1,3, 25 octobre 1954. [---] "UFO Reports from the Files of the CIA", by Richard Hall, Fund for UFO Research (FUFOR), USA. 1.0 Patrick Gross December 29, 2009 Conversion from HTML to XHTML Strict. First formal version. 1.1 Patrick Gross March 20, 2010 Additions [ud1], [ud2]. 1.2 Patrick Gross November 3, 2016 Addition [am4].